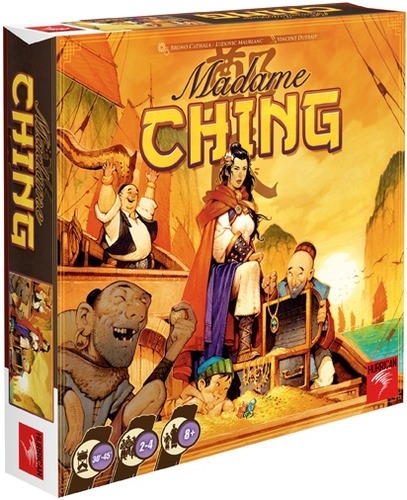 Madame Ching is a game by Bruno Cathala and Ludovic Maublanc, published by Hurrican and distributed by Asmodee. It is for 2-4 players. In this game, players will take on the role of pirates working to become the infamous pirate Madame Ching’s successor. Players will be playing cards to match symbols to complete missions. The player that can outwit their opponents and manage their hand of cards the best will be declared the winner. To begin, the board is placed in the middle of the play area. The cards are separated into different stacks. The encounter cards are shuffled and placed face down on their space at the top of the board. The 5 different sets of skill cards are placed in their spot on the board. The China Pearl and Hong Kong cards are placed in their respective places. The mission tiles are shuffled and a certain amount of tiles are drawn and placed face up on the board. The number drawn is determined by the number of players. If tiles with the same number are drawn, the new tile is discarded and a new tile is drawn to replace it. The navigation cards are shuffled and each player is dealt 4 cards. The remaining deck is placed on the board in it’s spot. Players choose colors and receive 2 pirate boats or Junks as they are called in the game of their chosen color. One is placed in front of them and the other is placed next to the space marked as #1. The gold pieces and gems are placed next to the board where everyone can reach them and play now begins. The game is played in a series of turns where players move their boats as far as they can to complete missions. 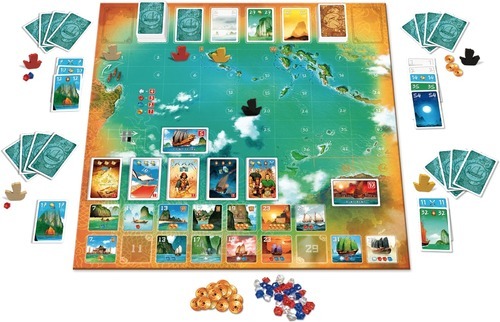 Before each turn begins, 1 navigation card is drawn for each player and placed on the spaces of the board beside the deck. The first card is placed face down while the others are placed face up. Players then choose a navigation card from their hand and place it face down in front of them. Players then reveal their chosen card at the same time. The highest numbered card plays first. The player then proceeds through 3 steps; expedition management, play an encounter card and draw a new navigation card. The first step is expedition management. The player takes their navigation card that they revealed earlier and use it to begin an expedition. The player begins by adding cards on top of the previous card. Each card played continues the expedition as long as it is of a higher value than the previous one. Playing the same color card moves the Junk 1 space in a straight line on the board. Playing a card of a color that hasn’t been used previously allows the Junk to move diagonally 1 space. If the player’s Junk crosses the first blue line they draw an encounter card. If they cross the second one, they draw 2. If they are able to reach space 49 or 56 with their Junk they loot Hong Kong and claim the card for it worth 10 points. If at any time during playing cards, the player plays a card of a lower value than the one previously played, the expedition is over and a new one begins. This last card is used to begin the next expedition. The player then checks where they are on the board with the missions and see if they are able to complete a mission or gain any skills. This is done by announcing the number that the player’s Junk is on. They are then able to take a mission tile of the closest lower number. They then receive any rewards that the mission gives them. The mission tile is then removed from the game. To gain skills, the player checks the cards they used during their expedition and compare the skill symbols with the skill cards. This is either 3 symbols of the same type or 1 of all 4 different symbols. Skill cards gained this way are then placed face up in front of the player. When it is used, it’s flipped face down. Once a player gains all four skills or a combination of skills and the elite crew joker card gained by using 1 of all 4 skills, the player gains the China Pearl worth 5 points. This ends the game. If a player can not complete a mission or acquire any skills, they draw an encounter card. If during the player’s expedition their movement would take them off the board, their expedition ends regardless of the card used. The next step that the player takes is to play an encounter card. This is optional. A player can play only one encounter card during their turn. These cards can provide many different benefits including attacking another player. Some cards allow you to add a skill of your choice to the expedition, while others let you draw 3 encounter cards. Some cards let you steal an encounter card from another player or even steal a gem from them. These types of cards are considered an attack. That’s important to note as cards like the Pilots can be used to cancel the effect of an attack. Still other cards provide treasures that are used to gain points at the end of the game. Skill cards can be played whenever a player likes and they provide many different abilities like taking a mission card up to 6 points higher than the space the player’s Junk lands on or adding an extra navigation card to your hand allowing the player to have 1 more card in their hand than before. The final step is to draw a card. This is mandatory. The player can choose either one of the face up cards or the face down card, adding it to their hand. Once a player completes this step, it’s the next players turn. The next player to go is the next highest navigation card. This continues in decreasing order until all players have performed all of their actions. This begins a new turn with new navigation cards being drawn. The game ends when a player claims the last mission card or a player takes the China Pearl card. In the last case, players are able to finish out the current turn before ending the game. Players add up their points with gold earning 1 point, blue gems 2, red gems 3, and white gems 4. This is added with any bonus points from skills, the China Pearl, Hong Kong or encounter cards. Also if a player has an expedition at sea beyond the #1 space, they receive a gold for each different skill symbol present on the navigation cards of their expedition. The points are added up and the player with the most points is the winner. This game has some truly beautiful pieces to it. The board as well as the cards have some amazing artwork to them. The designs are very much like those in Rise of Augustus. I really love how pretty they all look. This is definitely one of the prettiest games that I’ve ever played. The gems are all bright colored and see through plastic. They’re a little small but still look really nice. The gold coins are all thick cardboard as are the mission tiles. The coins look like Chinese coins and are very neatly done. The mission tiles, like the cards are very lovely. I just can’t brag enough on how great everything is. The production quality of this game is outstanding. You will love how it looks. The rulebook is as beautiful as the components. It’s laid out so nicely that you will have no problems understanding the rules for this game. There are so many pictures and examples. I really like that there is a fold out picture of the game setup that you fold out and can then read how to set it up with this large picture. I really thought that was a super nice touch. All of the skill cards are explained in great detail so there’s no confusion on how to use them. Likewise, the encounter cards are explained exactly the same way. Included in the rules are details and rules for a 4 player team game as well as special rules for playing with only 2 players. I’ve thrilled with everything presented here and feel that the high production quality didn’t stop just at the components. This game is a rather unique design. As I played the game, thoughts of Jamaica ran through my head. Granted the only thing that is similar is the pirate style theme, but I still couldn’t shake that feeling. I really enjoy the unique way of moving your Junk around on the board for each expedition through playing cards from your hand. I like that the further you go the bigger and better the rewards for completing missions gets. The game has quite a bit of strategy but most of it feels like what you do has very little impact on the other players. I guess with the exception of the few cards that attack the other players. Even then it’s not that much of an inconvenience. In any case, the game is very fun and I enjoy a lot. The theme is really great and feels like a real part of the game. All in all, the game is fairly simple but has enough strategy to it to keep even the most discriminating gamer happy. Madame Ching is a light to medium weight game of moving your Junk and completing missions. I never thought I’d say that in a review. The game is really great and plays in a very average time. Most sessions last no more than 45 minutes. The artwork, design and theme of the game is very beautiful and reminds me a lot of Rise of Augustus. Fans of games like Jamaica and Rise of Augustus should really enjoy the look and feel of this game. This one should even appeal to strategy gamers. There is very little player interaction apart from using some of the cards as attacks. It’s fairly simple to learn how to play and shouldn’t take that long to understand. This is a great game with a really neat mechanism for moving around the board. The theme is really fun and light. I really enjoy this game and I highly recommend it. For more information about this and other great games, please check out Hurrican and Asmodee at their sites. This entry was posted in Reviews and tagged asmosdee, board, board games, bruno, card, card games, cathala, ching, games, hurrican, ludovic, ludovic maublanc, madame, madame ching, maublanc. Bookmark the permalink.